In August 1995, Margaret Wurtele got the worst news any parent can receive: Philip, her twenty-two-year-old son, had just died in a climbing accident on Mount Rainier. At the time, Wurtele was absorbed in an intense midlife spiritual awakening. Suddenly she felt betrayed by the God she had only just embraced. In this beautifully written memoir, Wurtele takes us along on her spiritual journey in the aftermath of Philip’s death. With a novelist’s eye for detail, she conveys the dark nights of the soul and the crises of faith she experienced—as well as the love of family, friends, and community and the prayer that helped her move back from the edge of grief to find a rekindled and more meaningful spiritual life. For every woman—and for anyone faced with a personal tragedy or crisis of spirit—this heartfelt, exquisite, and wise book offers hope and comfort. Margaret Wurtele (Minneapolis, MN) is the cofounder and co-owner of Ruminator Books Press, a small independent publisher in Minnesota. The author of a previous spiritual memoir, Taking Root, she is a former board chair of Minnesota’s Episcopal House of Prayer and she and her husband own a vineyard in the Napa Valley. Losing a child is every mother’s worst nightmare. In this extraordinarily moving book, Margaret Wurtele tells the story of losing her only biological child, her energetic and adventurous twenty-two-year-old son, Phil. Phil was killed while attempting to rescue a climber who had broken his ankle on Mount Rainier. At the time, Margaret was just about to turn fifty and had been absorbed in an intense midlife spiritual awakening. Phil’s sudden death both plunged her into grief and made her feel betrayed by the God whom she had only just embraced. Written from the heart, Touching the Edge is the story of a smart and compassionate woman, of a sensitive son experiencing growing pains, and of their relationship. Brought up in the plains of Minnesota, Phil had a taste for adventure and had a lifelong fascination with the majestic beauty and inherent danger of mountains. He lived for the adrenaline rush of risk, from bungee jumping to diving off high cliffs into frigid waters to, most of all, mountain climbing. He was just coming into his own as a loving young man who was developing his own interest in spiritual concerns. With a novelist’s eye for detail and with remarkable honesty, Margaret Wurtele takes us along on her own spiritual journey. Her elegantly simple account of the crisis of faith she underwent in the wake of Phil’s death will resonate with anyone who has suffered a major loss, and her descriptions of the love and support she received from her family, friends, and community are both uplifting and instructive. Margaret shares the surprising insights that helped her move back from the edge of despair to rekindle a deeper and more meaningful spiritual life. Poignant, exquisite, and wise, this beautifully written account of one woman’s dark night of the soul is must-reading for anyone faced with a personal tragedy or a crisis of the spirit. 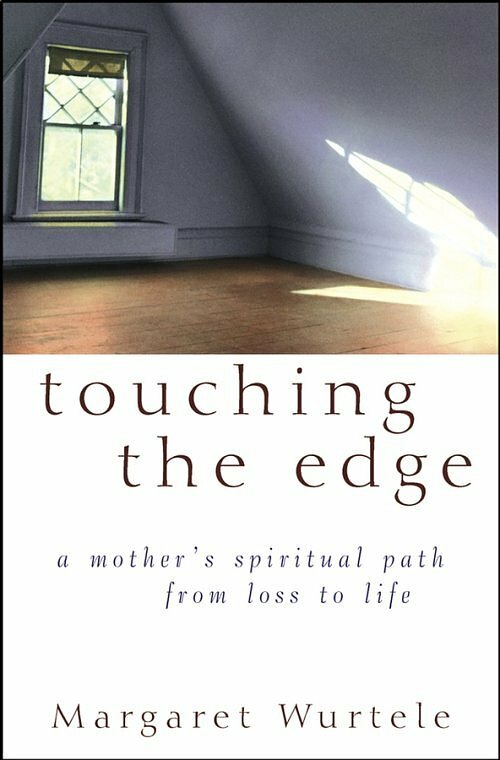 Touching the Edge offers hope, comfort, and inspiration to women and men in any circumstance who are searching for ways to renew the spirit and triumph in the face of adversity. MARGARET WURTELE was the cofounder of the Minnesota-based independent publisher Hungry Mind Press, now Ruminator Books Press. The author of a previous spiritual memoir, Taking Root, she is a former board chair of the Guthrie Theater and Minnesota’s Episcopal House of Prayer. She and her husband divide their time between Minneapolis and California’s Napa Valley, where they grow grapes and produce Terra Valentine wine.